1: The ground was built and opened in 1936, initially as an Athletics venue. Home of Brighton Athletics club, the only permanent structure was a small stand on one side of the pitch. 2: Brighton & Hove Albion FC moved in, in the year of 1999. They'd spend the 2 years prior groundsharing with Gillingham. This move was forced upon them after their board and owners - the despicable David Belotti and Bill Archer sold their ground for retail purposes and left them homeless. It was only due to the fans that some of the most repugnant and vile owners in the history of football did not bring the club to its knees. 3: There were considerable concessions made to local residents to allow the football club to move in. There was no parking to be had within a mile of the stadium and there was no amplified music allowed, apart from the classic tune of Sussex By The Sea. The music restrictions were lifted a year after moving in, but the parking restrictions remained, with a voucher for the park and ride being supplied with every matchday ticket. 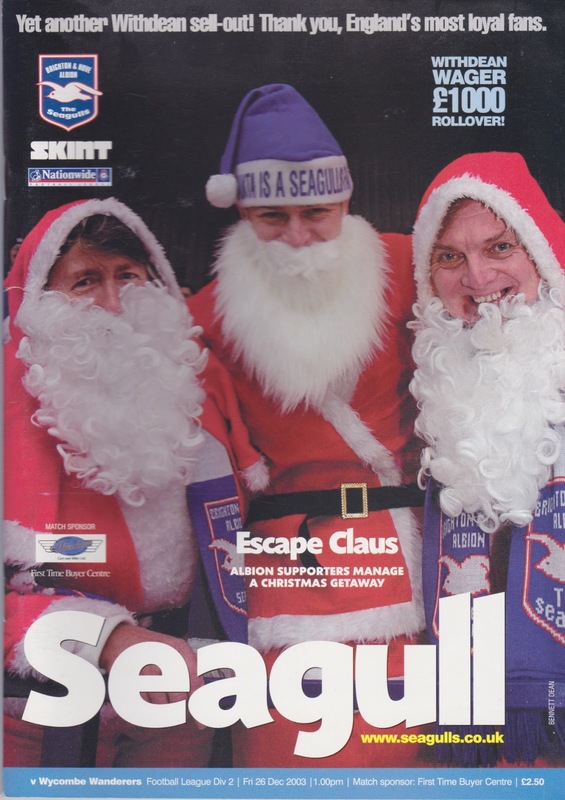 4: The club's first ever competitive game at the Withdean Stadium came on the 7th August 1999 and it was one to remember for the Seagull's fans to remember as they humped Mansfield Town 6-0 with Darren Freeman hitting a hat trick. 5: Brighton's biggest win at the Withdean came on the 11th November 2006. Northwich Victoria came with real hopes of an FA Cup upset, however they were sent packing with an 8-0 thrashing. Jake Robinson hit a hat trick for the Seagulls in what was remarkably their first victory in the FA Cup for 5 years. 6: The stadium was renamed 'Palookaville; for the game against Sheffield United on the 2nd October 2004. The name coincided of the launch of Albion fan Fatboy Slim's album of the same name. His record lable 'Skint' also sponsored the club's shirts for a number of years. 7: Despite it being extremely unpopular amongst visiting fans it managed to finish just 4th in an Observer article to find the worst grounds in the Football League in 2004. 8: The last ever Brighton and Hove Albion game was played at the ground on Saturday 30th April 2011. The visitors Huddersfield Town triumphed in a 3-2 victory. Despite this, it was a happy ending to the clubs stay at the venue as they lifted the League One trophy. 9: Some of the seating that was temporary has now been reused at Whitehawk FC of the Conference South. By coincidence, they themselves have attempted to move into the Withdean Stadium, owing to their own ground being limited. However, their approaches have never come to fruition. 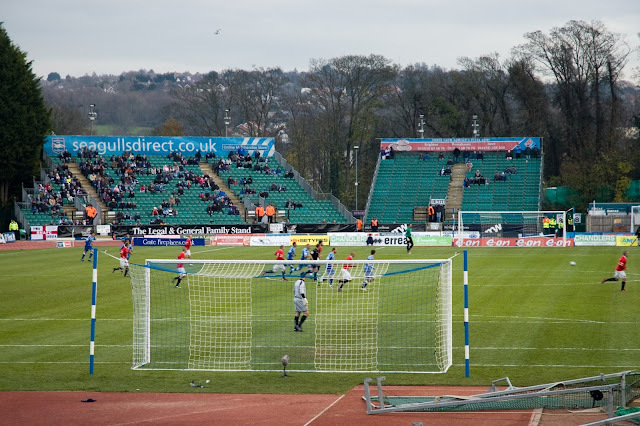 10: Since leaving the ground has still been used for football, albeit amateur teams. Brighton Electricity FC have used the stadium since 2014 with Old Varndenians and FC Twente Nil moving in a year later. I have been to the Withdean twice with Wycombe. On both occasions we were well beaten 4-0. The first time was in March 2002. Lawrie Sanchez was under pressure following some daft comments and some poor performances. This result did not help, as Wycombe were outclassed in youth team player Mark Leach's only game for the club.Bobby Zamora scored 2 and further goals from Paul Brooker and Paul Watson made it a miserable night for Wycombe. Brighton's stewards stopped us banging our drum as it made too much noise, yet they let off fireworks after each goal! I remember going on the official supporters coach as there was very little parking at the ground. Wycombe fans resorted to gallows humour as they'd had to do so many times towards the end of Sanchez's reign. Another miserable time was had on Boxing Day 2003, again a 4-0 defeat. We were under Tony Adams by this time. Our cause was not helped by having both Roger Johnson (foul and abusive language) and Mark Rogers (second yellow card) harshly sent off. Whether it would have made any difference to another poor Wycombe performance we will never know. In any case it was not the finest start to Matt Bloomfield's time at the club, who would have guessed then that he would go on to become a legend at the club and one of our longest serving players. A miserable day all round, not helped by a poor referee and one of my most miserable days watching Wycombe. 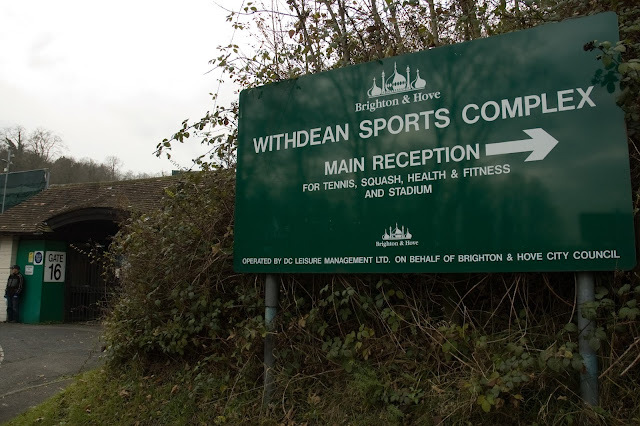 THE WITHDEAN STADIUM signalled Brighton & Hove Albion's return to the locality after a period groundsharing with Gillingham, but it was far from ideal. For a start, just as at their current home, local residents did not want them there, so supporters were subject to heavy parking sanctions. I don't recall there being a huge amount around the ground, just a sports bar which I frequented on my first visit. The ground itself was pretty horrific too. Athletics and football do not mix at the best of times, and this venue was no exception. The home fans didn't have the best of views but they did at least have 'only' a running track wrecking their view. Visitors were shunted away in one corner with them being almost half a football pitch away from the nearest goal in terms of distance. Also, it was uncovered, as was the majority of the ground, including the biggest stand along the side, which was reserved for home fans. In its defence, it did mark a return to the area for the club after a period of exile, and the surroundings were pretty pleasant. All pictures are my own, apart from the first and last ones, which were obtained off of Flickr.